Perth Vintage Cycles: My 1974 Raleigh Tourist DL-1 Roadster. My 1974 Raleigh Tourist DL-1 Roadster. 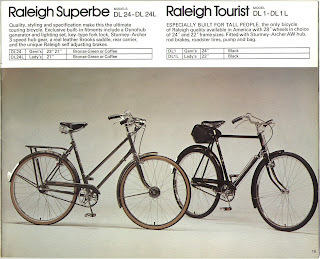 ... extract from the 1974 Raleigh Catalogue. 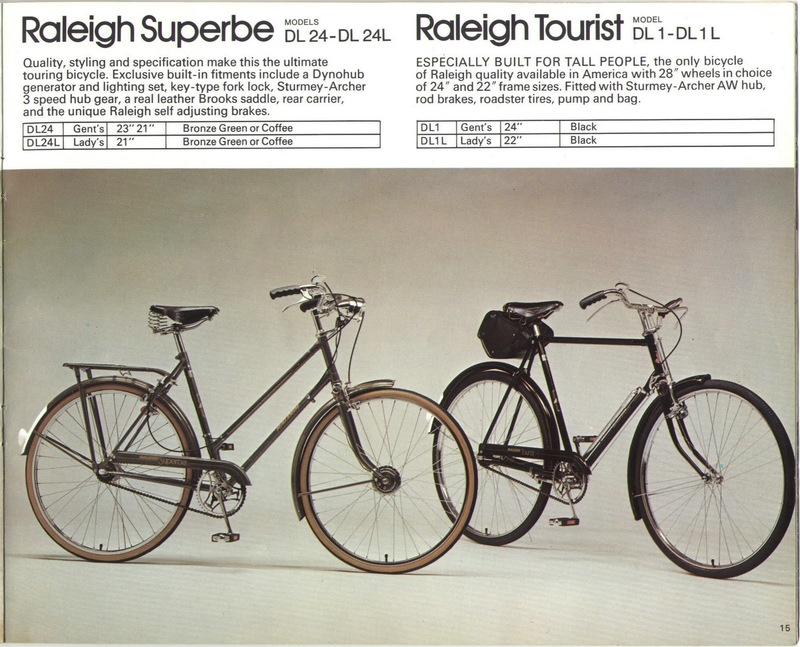 In September 2009 I was lucky enough to come by a 1974 Raleigh Tourist DL-1 gents roadster bicycle. The owner was reluctant to sell the bike, however, he was downsizing his somewhat large collection of vintage bicycles and needed to sell some to make room in his house. I saw the bike and after a short ride I pretty well fell in love with it, it rode beautifully. This DL-1 had a Sturmey Archer AG 3 speed dyno hub on the rear, with front and rear rod brakes. The dyno hub was working well and was coupled to a dry battery unit that was positioned on the seat post. The saddle was non genuine and was a little worse for wear. There were a few scratches on the frame and the chainguard, this was consistent with a bike that had been used sparingly considering it was a 35 year old bicycle. I had always been interesetd in DL-1 roadsters - a commanding bicycle commonly ridden by English gentlemen throughout the ages. Raleigh started making them in the mid 1930's and continued to make the same model (with only minimal changes) until the early 1980's. They maintained the use of rod brakes on all DL-1 models throughout this time, even when more efficent (cable) braking systems were available. The owner had brought it years before and had stored it for some time. Prior to storage he sprayed some type of wax over the whole bike to prevent any rust or corrosion......and prevent rust it did! The bike was in fantastic condition, although the rims and spokes had not been covered in wax and had deteriorated with surface rust. .....the shine after wax removal. After taking the bike home my first job was to take it apart, clean the wax off each component, regrease, re-oil, and then carefully re-assemble. Prior to re-assembling I re-chromed the big 28" x 1 1/2" Westwood rims and had the wheels re-spoked with stainless steel spokes....the wheels are big bully busters but they run as smooth as silk - love those chunky tyres! I was really impressed with the Sturmey Archer three speed AG dynohub on the rear wheel, it polished up beautifully......no rust here, and it worked as though it was brand new! ....put your sunglasses on for the next photo!! 1974 Sturmey Archer AG Dyno-three rear hub. I didn't re-fit the dry battery unit as it was tarnished and it cluttered up the majestic clean looking frame. I replaced the original lights (front and rear) with an old 1950 Sturmey Archer set that I had collected sometime prior, although as yet I still haven't re-wired the lighting system.....another job for another day. The older set of lights look so much better than the original 1974 retro jobbies. I was lucky enough to locate a "new old stock" black leather 1974 Brooks B72 saddle, the type of saddle that was original equipment when the bike was first manufactured. The chrome on the underside of the saddle is perfect and compliments the rest of the chrome on the bike. And of course I couldn't resist getting a new Brooks Millbrook saddle bag to suit - a reproduction copy of the original issue holdall saddle bag. Brooks B72 with Millbrook saddlebag. I think the most unique feature of the bike is the locking mechanism on the steering column. 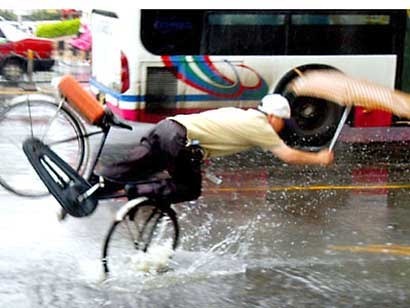 I don't know why this idea hasn't been picked up by manufacturers for your daily ride. The key elevates a rod from the top of the front fork crown that restricts the travel of the handlebar so you can't steer correctly when it's locked in the upright position....a great idea that's been lost through time. Heavy duty chainwheel with chain guard. Beautiful chrome on Raleigh stamped handlebars!! Under side of rear hub. 28" x 1 1/2" Westwood chromed rims. Happy roadstering, and above all be safe!! Wow! Beautiful bike! It's got the chain wheel from a model with a full chain case. Interesting (and really cool) that it also has a dyno hub and a locking fork. Do you know the background story on it? BTW: The locking fork mechanism is still very common in European and Asian bikes. It just never really caught on over here. Great looking bike and awesome story! I just purchased a 1980 DL-1 in pristine condition, unfortunately didn't come with a locking fork or a dyno hub but a nice bike none the less. Mine does have a full chain case.